Taken from a 1952 Church Centennial brochure. 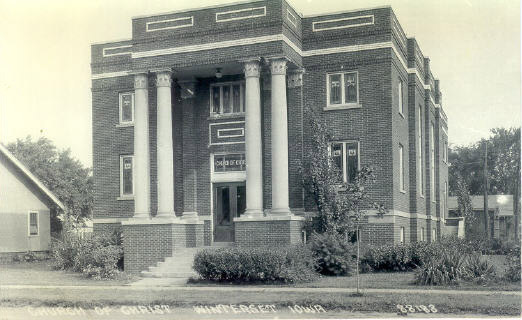 The Church of Christ at Winterset, Iowa, was organized in the home of Joseph Brinson, on the first Lord's Day in December 1852. Brother Irvin Gordon was the minister who gathered about him a few Disciples and guided them on the day of their organization. Meetings were held in the homes of the various members and for some time in an upstairs room on the west side of the square. In 1857, a frame building was constructed about three blocks west of the northwest corner of the public square, where the home of Mr. & Mrs. Lawrence White now stands. This was a large unpainted building built of our native oak and walnut, at the cost of $1200. This building was used through the week for public school classes. The ministers who served the congregation during this time were Irvin Gordon, Washington Short, G. W. Carpenter, J. B. Noe, D. R. Dungan, and N. C. Corey (father of Abraham Corey). About four years later they purchased a building belonging to the Presbyterians. This building stood back of our present parsonage. The ministers who served in this building were James Roach, Peter Russell, James Conner, J. A. Walters, Charles Blanchard, Joel Brown, O. P. Badger, J. K. Cornell, and O. H. Derry. Occasional ministers were Butler Bird, Joseph Missildine, and Mr. Vawter. 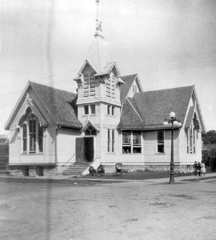 A new frame building was erected in 1889 (see photo " 3rd Church" above) on the sight of our present building. The pastors who served in this building were Revs. Wiskizer, Wells, A. E. Major, J. M. Lowe 189?-1899, T. R. Hodkinson 1899-1900, A. D. Veatch 1901-1903, J. H. Swift 1904-1905, O. M. Pennock 1906, S. D. Harlan 1907-1908, R. E. House 1908, Ragan 1908-1909, Leonard F. Davis 1909-1915, B. B. Burton 1915-1918, E. L. Hosier 1918-1919, O. P. Ballenger 1919-1920, N C. Carpenter 1920-1921, E. Chancellor 1921-1924, and F Clare McCallon who came in 1924. Our present parsonage was built in 1920 and the following year the church was remodeled. A basement was excavated and the walls of the church stuccoed. In 1925, during the pastorate or Rev. McCallon, this building was torn down and our present church building (see photo "4th Church" above) was erected at a cost of $40,000. In this building the following pastors have served: Rev. F. Clare McCallon 1924-1928, H. L. Olmstead 1929-1938, and Tom Foglesong 1938-1947. In 1945, the sanctuary was remodeled and an electric organ was purchased. This page was created on January 1, 2007.